There is just something about running and racing that I love. 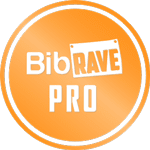 Maybe it's the energy/nerves combo or the large amount of bananas present at most races or the herds of sweaty people that love to run too. Really, what's not to love? Racing as a family makes it 110 times even more special! 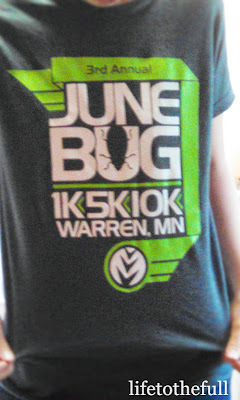 Leo, E, and I ran the June Bug 10k together on June 14th. Leo even held my hand crossing the finish; it pretty much made my month :) E worked his little diapered rear off as he slept for most of the 6.2 miles in the stroller. 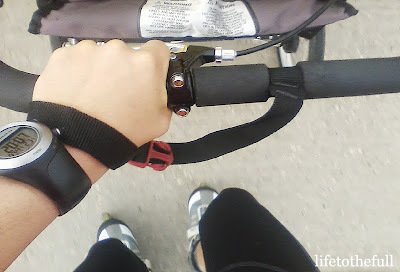 Rollerblading with the jogging stroller is the next best thing to running! 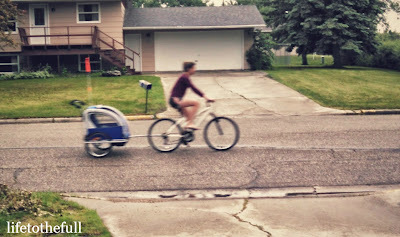 If you try this at home, make sure your stroller brakes and back brake on your roller-blades work really well, especially if you live in a hilly area (unlike me). Here is a picture of me biking super fast - notice the blur (or it's possible Leo took a quick picture with his phone and it didn't turn out too well). We got our first bike trailer last week! It is a 3-in-1 double trailer - jogging stroller, everyday stroller, and bike trailer. The trailer has been good so far, though our BOB Ironman single stroller is still my favorite for running and walking. The June Bug is a great local small-town race and the 10k course consisted of two loops. The loop was mostly paved minus a half mile section of gravel. The weather was comfortably cool that day with gusting winds. Once again, I started out way too fast in the race, especially for running with a stroller. Leo ran alongside E (in stroller) and I the whole way and I really appreciated the motivation. Whenever I start out fast, I know I'm destined for a much more uncomfortable/painful finish. After finishing the first lap, I thought "Waaaait, I have to do that gravel stretch again?!". Wind and gravel proved to be extra tough with a stroller; I felt like I was running with a parachute but it's totally worth it to be together as a family. The two women who were running with double jogging strollers definitely take the cake (I hope I can be that awesome one day). I did walk a few strides each loop on the nasty gravel stretch though our fast pace in the earlier miles made up for it. Overall, this race was a blast and I am so thankful God blessed me with the opportunity to race with my family. Plus, we received a little prize money that covered our entry fees plus some for a quick coffee date before heading home! P.S. This race had my favorite race t-shirt design of all time. Grey is my favorite "color", the design is great, and the shirt material is cozy (and they actually fit)! P.S.S. Are you pregnant or have a pregnant friend? For Two Fitness has adorable maternity clothes for active women. The "Running for Two" shirt is definitely my favorite! 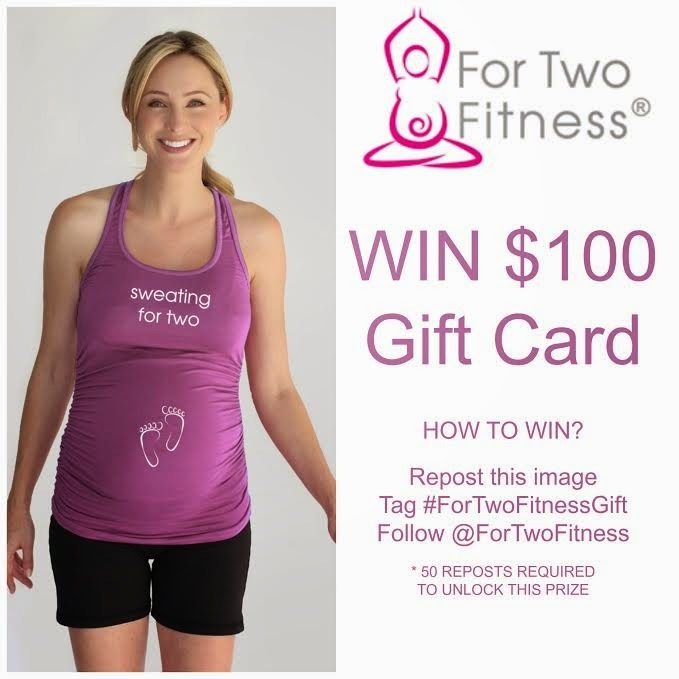 One lucky instagrammer will win $100 gift card to For Two Fitness - the very best in maternity activewear. Simply post this image on your instagram feed along with the tag #fortwofitnessgift and mention @fortwofitness. Include in your comment the item or items you love the most. A minimum of 50 reposts will be required to unlock the prize, so share with all of your pregnant friends, and good luck! What is your favorite part about running/racing? How about your favorite color? Linking up at Fitness Fridays and Mommy Moments. I can't even believe your times! Congratulations, what an accomplishment! Great job on the race! 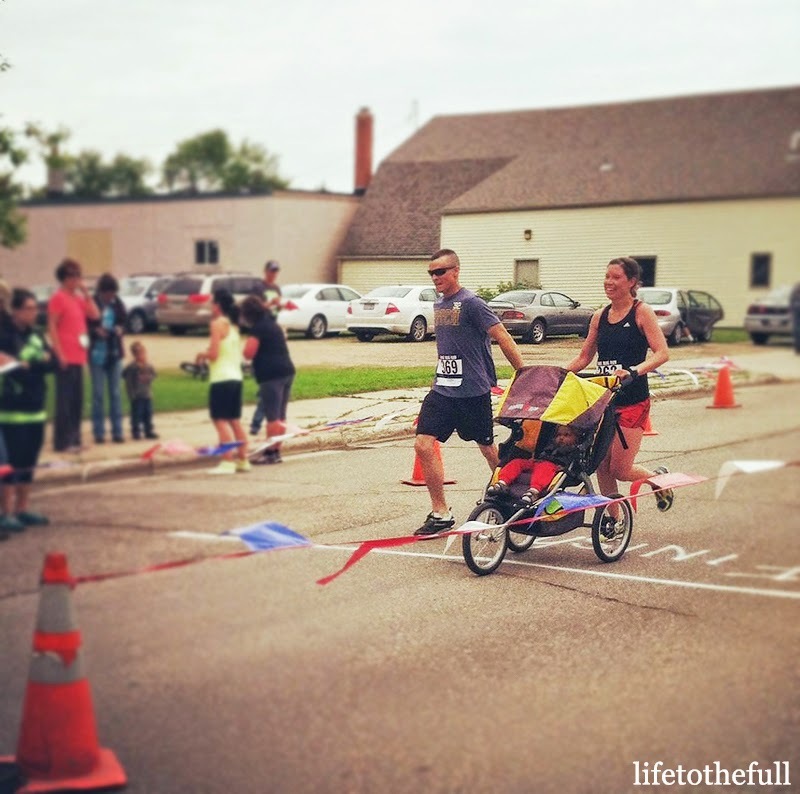 Great finish and with a jogging stroller! Mama beast!